Find sun and a wealth of history in Dalmatia. 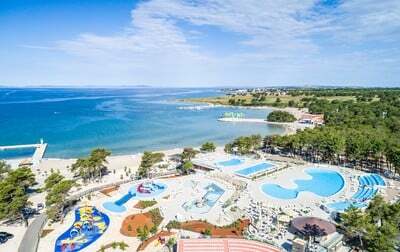 We have chosen to set up mobile homes and bungalows in our luxury campsites in this region of Croatia, where the attractions are numerous. Campers can experience its cultural heritage with a visit to theTemple of Jupiter in Split or to the Ivan Meštrović Gallery, a large art museum dedicated to the famous Croatian sculptor. Holidaymakers can also enjoy the beauty and harmony of Brac Island. A short distance away from Split, our campsites in Croatia allow you to take full advantage of the town’s seaside location. The Riva is a must-see promenade in Dalmatia and is a key spot for all those campers wanting to experience Croatian nightlife. Gourmet campers will find our campsites ideally placed for the town’s numerous restaurants. Local specialities are always on the menu: fried or grilled calamari, Sarma – cabbage leaves stuffed with minced meat and rice – or octopus salad. Campers who want to get into the party spirit can sip cocktails in one of the many bars on the promenade or discover wild Croatian rhythms in one of the nightclubs. And the icing on the cake of this dream tourist destination for camping holidays, the Mediterranean climate allows all our campers to make the most of the multitude of activities on offer in Dalmatia: diving, cycling, rafting… The choice is yours!